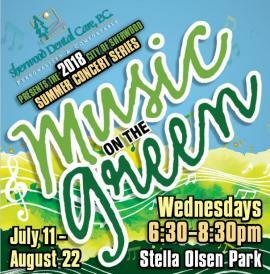 Music on the Green is a family oriented concert series that is held Wednesday evenings in July and August, at Stella Olsen Park in Old Town Sherwood. Bring a lawn chair or a blanket and settle down for an evening of relaxation and entertainment. Enjoy tasty food from their on-site food vendors or find pleasure in a refreshing glass of beer or wine. Beer and wine will be available for purchase, provided by the Sherwood Historical Society. Sweet treats will be available by Little Foot Ice Cream Truck and So Simple Shaved Ice. BBQ food options will also be available, provided by Tree’s Restaurant.